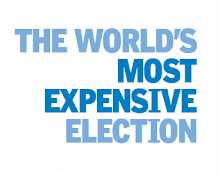 Most of the 21 political parties that approached the Election Commission on February 1 seeking matching of votes recorded in 50% EVMs with paper trail, had communicated a different view to the poll panel barely five months ago. 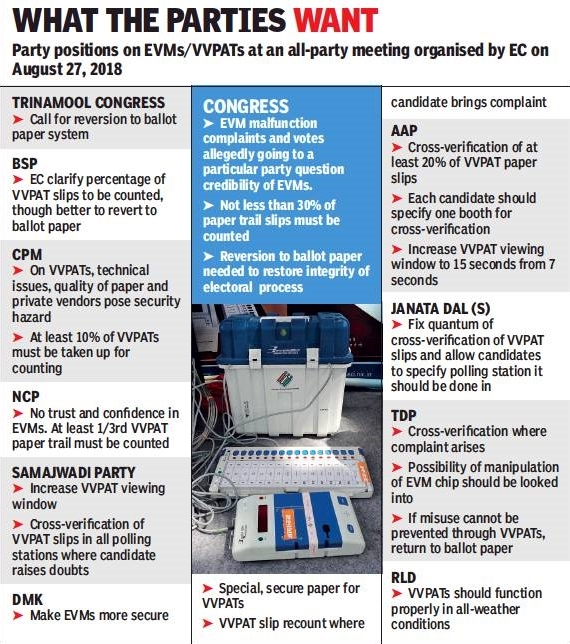 At the all-party meeting organised by the EC on August 27 last year, the Congress proposed tallying of 30% EVMs with VVPAT slips, NCP 33%, CPM 10% and Aam Aadmi Party 20%, even as parties like BSP, Trinamool Congress and National Conference categorically sought reversion to ballot paper system. According to a summary of positions taken by various national and state parties at the August 27 meeting, DMK, Janata Dal (Secular), Samajwadi Party, Rashtriya Lok Dal and TDP — all of which made a joint petition to EC last week demanding 50% match of EVMVVPAT count and 100% match where winning margin was less than 5% of votes cast — did not reject EVMs outright but suggested alterations in system of paper trail count. Currently, the EVM count for one randomly selected polling station per assembly constituency is tallied with the VVPAT slips. 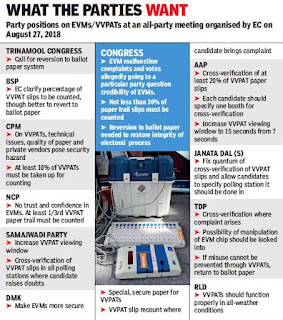 Congress — which led the delegation of over 20 opposition party leaders who raised EVM concerns before EC on February 1 — had questioned EVM credibility at the August 27 meeting, citing instances of EVM malfunction and votes allegedly going to a particular party. Its representative suggested that deployment of old versus new EVM models be made public and no less than 30% of paper trail be counted. This, even as the grand old party noted that reversion to ballot paper was needed to restore integrity of the electoral process. While Trinamool demanded return of ballot paper, BSP wanted EC to clarify on the percentage of VVPAT slips to be counted, adding that it was better to revert to ballot paper.